Another solid installment of the Pink Carnation series and another enjoyable read. While for me this one started off a little bit slow it picked up the pace and became really enjoyable. Robert Duke of Dovedale is the kind of character I could conjure up a true image in my head of. I really liked him and even though some of his actions ticked me off (why couldn't he just tell Lady Charolotte the truth?!) I also understood why he did them. He thought he was protecting her and that is of course how these books work. While the spy craft is still around in this book it does focus a little bit more on the love and fairy tale aspect of a historical romance which to me made this one a little bit more light and fun. There is still the spy side and a little bit of danger to keep it spicy. Then there is the modern side of the story as we always have that bit to play with as well and this time we saw Eloise thinking that Miles was a spy. This lead to some very comical situations and then eventually he had to confront her. Bottom line enjoyable and I look forward to reading the next installment. 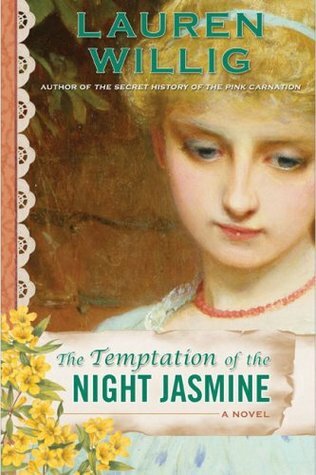 Sign into Goodreads to see if any of your friends have read The Temptation of the Night Jasmine.